(1). There is often widespread vandalism of the bikes docked in stations. (2). Residents want to be able to pay with a combination of credit cards and “smart cards” used for other modes of public transport. However, these two forms of payments are not integrated, leading to problems for users. (3). Dedicated bike lanes often end abruptly and fail to connect with other bike lanes, making cycling in the city less safe. (4). Neither the bike share system nor the bike lanes were designed with other modes of transport in mind and are therefore not sufficiently integrated with public transport. In many ways, a successful bike share program requires a thriving bike culture. Without this local support and frequent use, bike share systems can become neglected, making vandalism and bike theft more likely. One effective way to build up bike culture is by engaging youth through cycling programs, who can continue using bikes into adulthood. For example, one program is allowing university students to rent bikes for commuting to and around campus as a first step toward building local bike use. 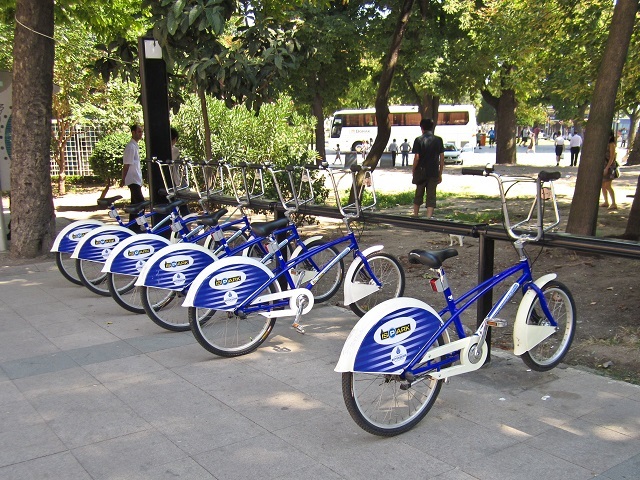 İSPARK, the operator of Istanbul’s bike share, is collaborating with Yıldız Technical University—Turkey’s third oldest university—to establish bike share on campus. Since dedicated bike lanes often end abruptly and fail to connect with other bike lanes, Turkish cities can make cycling safer by prioritizing connectivity. Cycling networks should also be designed as coherent, optimized systems, connecting residential areas with dense commercial and business-oriented districts. Good examples that meet these requirements include the systems in Amsterdam, Copenhagen, Paris and London. Integrating bike share with other modes of transport is critical for ensuring an effective bike share system. While cycling can complement other modes of transport and allow for multimodal commutes, car-centered development has greatly limited the mobility of cyclists. For example, peak hour traffic makes cycling dangerous, particularly on roads without dedicated bike lanes—rendering cycling isolated from other modes of transport. As a result, cities should position stations in areas that need last-mile connectivity, and develop roads with cyclists in mind. Doing so encourages residents to integrate cycling into their daily travel routine, and increases the mobility of cyclists. Finally, cities should integrate bike share payment methods with other modes of public transport; for example, Washington D.C.’s SmarTrip card and London’s Oyster card allow users to pay for most public transportation options with a universal method. As Turkish cities become more populated, integrating public transport with walking and cycling should no longer be a secondary concern, but a primary solution for improving sustainable urban mobility. For this reason, cities across Turkey have begun studying diverse bike sharing programs that have been implemented globally. In ten years, cycling networks in Turkey will almost certainly be far more cohesive and accessible, thanks in large part due to bike share and the shift away from personal vehicles. But first, decision makers have to recognize and solve these challenges holding Turkey’s bike share back.